Is It Time for The Times of Israel? Many of my fellow bloggers in Israel have moved their blogs to www.timesofisrael.com, an ambitious new online endeavor launched by David Horowitz, former editor of The Jerusalem Post. I too could move to The Times, but I don’t want to rush into stardom. I like my loyal 20-120 readers. There is something intimate about writing a blog on a web site that a few people visit, many of whom are related to me. I like the banner on my web site, my photo of a piece of Palestinian embroidery from a dress I bought in the Old City in 1968. I like the writing implements on the right side of the banner, sitting in a cup (which you can’t see because my talented daughter cropped it.) The cup was a gift for my fifth birthday. Certainly you must have noticed by now that one of the writing implements is a kulmus. That’s a Greek word for a pen made from a reed. The kulmus, like the feather of a kosher bird, is deemed kosher for writing mezuzot and Torah scrolls. I like the fact that this particular kulmus has accompanied me from my days as a guide at Neot Kedumim, The Biblical Landscape Reserve in Israel (1993-2000) straight into the digital age of blogging. If I join the The Times blog page, I will have to leave these images behind. Moving to The Times, should I decide to do so, is like taking the blog out of the country and sticking it in an office on the 44th floor of a hi-rise building on a block with twelve other hi-rises in the midst of a bustling city. 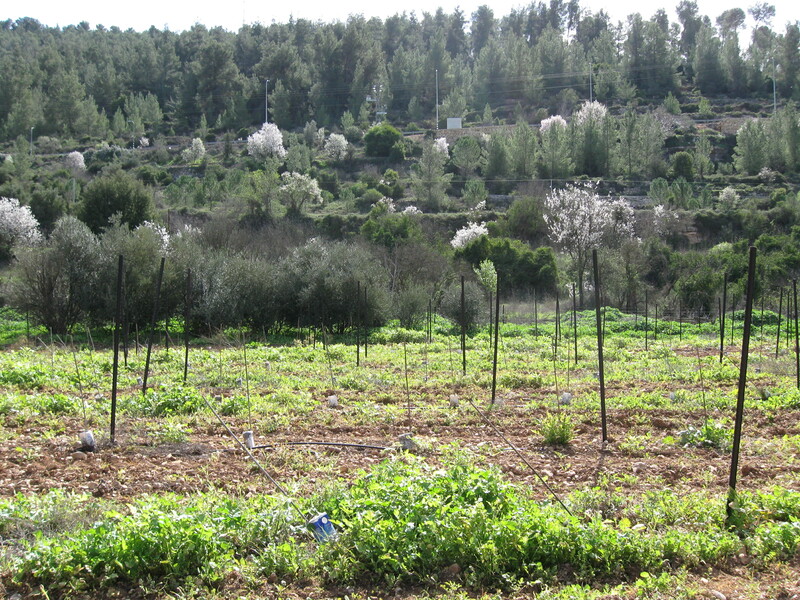 The blog looks out the window and sees only windows and more blogs, while today, when it looks out the window, it sees vineyards, blossoming almonds and pines. The Times of Israel aspires to be a serious online daily. One of my favorite writers, Mitch Ginsburg, is the military correspondent over there. I love the fact that the military correspondent writes and translates fiction in his spare time, of which he will have little now that he has taken this job. If I decide to blog with The Times, the blog editor will need a photo of my face. I can’t decide which image I would like to offer my potential new anonymous public. Should I let my hair hang over half my face — the right side with all the pock marks from adolescence — giving the impression of a mysterious ingénue? Or should I pull my hair back with conservative barrettes and play the wise old gray-haired woman? Should I smile or sneer? These are serious considerations. If I decide to move, it will be hard to say good-bye to my baby blog. It’s still learning to walk. Who will pick it up over there at The Times? All these concerns prevented me from giving a spontaneous Yes to the blog editor when we spoke last week. I know The Times needs women bloggers and they probably need bloggers to represent the over sixty-five crowd and they certainly need bloggers who do not voice opinions on Iran, anti-Semitism and strawberries. They want bloggers who react to their inner conflicts rather than geo-political, macro-economic and international conflicts. Still, do I want to fill the gap of soft news? And then there’s the problem of fame. I’d hate to be driven to drugs like Whitney Houston and end my career in a Beverly Hills bathtub. Somehow, staying in the woods outside Jerusalem and keeping a low profile (about forty-four meters below the rader) suits me. Then again, isn’t a writer supposed to want a large audience? If I don’t crave a large audience, am I still a writer? Can I learn to accept having more than 120 readers? So goes my ambivalence. I share it with you today just in case I decide by the next post to cross over. Should that happen, you will receive the first two sentences of a blog post from writeinisrael.com followed by the line: To read the rest of this blog, click www.timesofisrael.com If that should happen, know that I will always remain faithful to you, my first readers. This entry was posted in Uncategorized and tagged Times of Israel. Bookmark the permalink. 10 Responses to Is It Time for The Times of Israel? I love you and your blog just as you are, but should you cross over I’ll still love you. To quote the late Whitney Houston, I’ll always love you. Dear Esther, The perfect response! Thank you. is it either or— can you have it all? i’m with you either way although i like to think of your voice reaching out to many and to the new experiences this might bring to your life…you can always go back, or can you? Right, I can always return. It’s tempting to think of the “new experiences.” Can we ever have it all, Jane? Judy I’ll love you and you’re blog where ever you go. As to your look, since you asked. go back to the cute pixie short haircut with streaks . Wear lipstick and earrings for the photo. You asked…..
Just when I’m getting used to long hair … You mean I can’t look pale and anemic in the photo? Thanks for the tips, Tzirelchana. Judy, wherever you go I shall follow. Many people will be enriched by reading your blog. I think the challenge is not to let a few cantankerous readers ruin your day. Thank you, Shoshana. Knowing you are with me will help. Judy, I’m surprised there’s even a question in your mind. I for one have always known you deserve a larger audience, and here it is, on a platter. You can always opt later for (relative) obscurity but now’s the time to break out. And we’ll all be there to cheer you on! Dear Evan, Thank you for telling me I deserve a larger audience and reminding me that I can opt out later. I will dive in or cross over or break out, as you call it. I broke out so much when I was fifteen, I still have the scars to show for it. Hopefully, this will be easier.